A warrant should always be required when the government wants to read your email or any other form of online communication. I thought I would share a way we can help make a change. 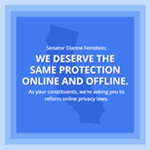 We deserve the same protection online as we have when offline. If you agree, keep on reading.